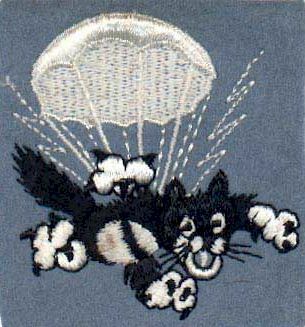 The "Wildcat Patch", which was soon shortened to "Cat Patch", had been dreamed up by the Walt Disney Studios some time shortly after 7 Dec 1941, and several paratroop units adopted similar Disney based patches. The backgrounds remained the same, and the number of the unit was added, so the design was hardly unique to the 503d. Les Hughes, currently the webmaster of the American Society of Military Insignia Collectors recalls several variants of the cat patch, as during his years as a collector he's had at least two examples of the version on a felt square, each coming directly to him via a veteran of the 509 Parachute Infantry Battalion. He's not seen any examples suggesting the patches were used by any unit other than the 503rd, but leaves the issue open. Of his examples, one was embroidered on a light-blue felt square (see below) and the other fully-embroidered on a disk (see table). The cat is colored differently in the square and disk versions, but the cat is the same. The disk version also exists, he says, with both an embroidered border and an olive drab wool border. He recalls seeing the fully embroidered disk versions in two sizes. Les says that the 509 had a well know patch of its own ("the Gingerbread Man"), made in Italy and approved for wear by the men locally, but never approved by the Army. He considers it unlikely that the Army would ever formally approve a design executed by Disney as an official patch, as "the Institute of Heraldry was rather rigid in the types of symbolism it would allow." " Over and through a light yellow disc, BUGGS BUNNY proper seated on the left wing of a caricatured grayed green aircraft, holding aloft a carrot proper with the left forepaw, and shoving a tan and brown aerial bomb off a wing tip with hind feet. (Approved 20 Dec 1943). 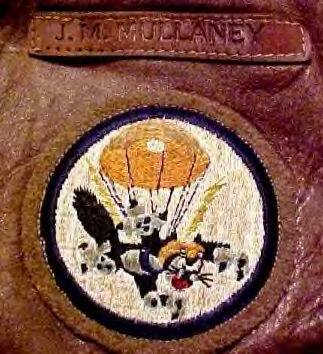 This is the patch from Jim Mullaney's A-2 leather jacket. Jim writes..."I was issued this jacket in June or July 1942 at Fort Bragg. Everyone didn’t get one and there was some grumbling when yours truly - a lowly 2nd Lt. - received his. Seems I had a close friend in supply who made these decisions. His name is Elden Campbell and he presently lives in Virginia. After arriving in Aussieland, Elden was in charge of the parachute packing and drying sheds in Gordonvale.. After all these years I still remember him as if it were yesterday…"
How might veterans of the 509th come by the 503d's Cat Patch? "Well," Les says, "the 509 began its existence as the 504th Parachute Battalion, the fourth and last independent parachute battalion of the Army's fledgling airborne forces. When the Army realized the inadequacy of an airborne force of only four battalions and began forming its parachute units into regiments, the 504th Battalion became the 2nd Battalion, 503rd PIR. As the 2/503 PIR, the unit was deployed to England in June 1942, where it trained for the Army's first airborne operation of WWII: a drop on North Africa. 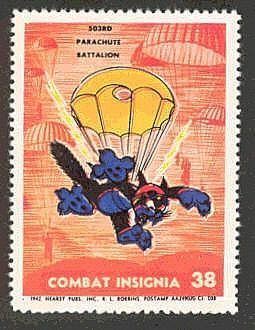 Just prior to deploying to North Africa, the unit was redesignated 2/509, and later, when the decision was made not to complete the regiment, it became the 509th Parachute Infantry Battalion. Anyway, it seems clear to me that the 509 vets had the "cat patch" by virtue of their having once been part of the 503d. This also tends to date the patch - at least the square version - probably to early 1942." 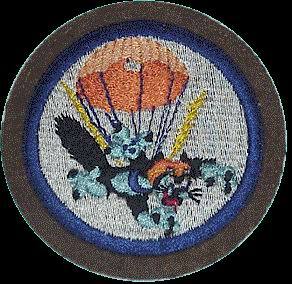 Whilst early versions could have been seen in Africa in 1942, the cat patch was in wide SWPA use certainly by Nadzab. Elden "Buzz" Campbell also made reference to wearing the "cat patch" on the leather flight jacket while serving in Nadzab. Don Abbott, who was an early Battalion member is 'almost certain' that it was not an official patch, and he cannot ever recall wearing it on his Class A uniform, or ever seeing it there. He recalls only sewing it onto one of the old field jackets but nowhere else. Verne White, who was not an old-timer with the 503rd when he was seriously wounded on Corregidor, wore the Cat Patch proudly on his Class A's on his return to the US, through to his discharge in July '45. "Nobody told me it was not an official patch and it did draw a lot of favorable comment during that 4-5 month period." It is well documented elsewhere that local commanders had the authority to approve insignia worn by the troops in their command for "local wear". Nothing "official" was necessary. Bob Flynn recalls a photograph of Harris Mitchell , wearing a leather flight jacket with the "cat patch" sewed to the left breast of the jacket, sitting in an orderly room busily engaged in writing. This practice was the basis for the stand which Bob took in the research of the "Rock Patch" painted by Tom Mc Neill on Mindoro following the Corregidor campaign. Hugh Breslin criticized Bob's committees' findings in a letter to the Static Line about a year ago. Bob says "General Jones approved the "Rock Patch." He told me this at the reunion in Little Rock. He also stated that he asked Bill Bossert to improve the drawing of the eagle on the Rock Patch." The fact that field commanders can approve insignia "for local wear," is well documented. So, there you have some leads. Those of you who know Buzz or Harris can easily satisfy your intellectual curiosity. Copy us in on what you find. Credit goes to http://www.skysoldier17.com/ for this page.